Putting together a playlist can take time and effort. Using smart playlists, you can have iTunes do the work and create your playlist, based on specific conditions you establish upfront: how fast a song is (based on BPM, or beats per minute), the type of music, a song’s rating, and so on. You can also limit the playlist to a specific length. 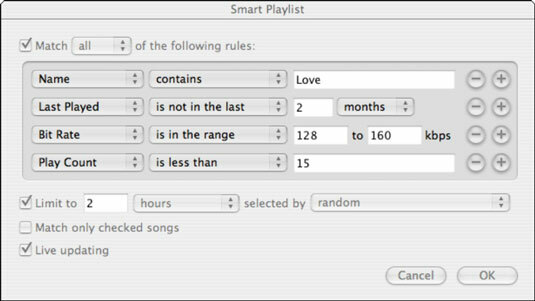 To create a smart playlist, choose File→New Smart Playlist. In the dialog box that appears, click Add (+) to choose from pop-up menus the parameters on which you’re basing the smart playlist. Click the – button to remove a condition. The Smart Playlist in the figure has iTunes looking for all songs with Love in the title that you haven’t heard in a couple of months or haven’t heard more than 14 times. The song must have been encoded with a bit rate between 128 and 160 Kbps. The overall length of the playlist cannot exceed two hours. If you want iTunes to alter the smart playlist as songs are added or removed, select the Live Updating option. 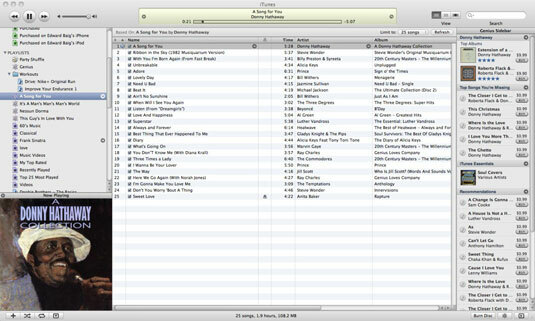 With the launch of iTunes 8, Apple unleashed a powerful new Genius playlists feature. In a nutshell, it promises to create an instant playlist of songs from your library that mesh well with a given song you’re listening to. Click the Genius button when listening to that track to generate the playlist. A Genius playlist is created based on the song you chose. You can save a Genius playlist and instantly refresh it if you don’t like the results. And you can limit the collection to 25, 50, 75, or 100 songs.